Drive a ways along a narrow country road thirty miles north of Baton Rouge, Louisiana, the late summer morning filtering through the leaves as you pass acres of cow pasture and a few small churches, and you’ll come across a white picket fence leading to the last thing you’d expect to find here: a medium-security prison. First comes the octagonal guard tower, peeking over the trees, then the block brick buildings and drab exercise yards, enclosed by chain-link fencing topped with curly razor wire, 15 feet high. You’ve reached the Dixon Correctional Institute, home to 1600 inmates whiling away everything from a few years to life. That’s where I found myself in early September 2012. I hadn’t come to visit the inmates. I’d come to see the cats and dogs inside. Seven years ago, when Hurricane Katrina barreled down on the GulfCoast, hundreds of thousands of residents fled their homes, leaving their pets behind. Most weren’t being cruel—they left food and water, assuming they’d be back in a few days, as they had after previous storms. They didn’t realize that Katrina and the floods that followed would decimate the region, demolishing homes, killing hundreds, and drowning a city. Fortunately, animal rescuers poured in from around the country, saving thousands of dogs on roofs, cats in attics, and pets wandering homeless on the streets. They trucked them to emergency shelters throughout the area, including a massive triage operation that had been set up at the Lamar-DixonExpoCenter in Gonzales, Louisiana, sixty miles northwest of New Orleans. The facility—a venue for livestock shows, horse exhibitions, and rodeos—would become the epicenter of the largest animal rescue operation in U.S. history, staffed with hundreds of volunteers and veterinarians caring for more than 8,000 animals salvaged from the storm. But as the weeks wore on, Lamar-Dixon began to overflow. There was no space left to shelter the cats and dogs. They sat in cages in parking lots. Thousands were in danger of becoming lost or dying. That’s when Jimmy LeBlanc got on the phone. Dixon Correctional’s warden, LeBlanc had recently lost his 17-year-old Yorkshire Terrier, and he wanted to do something good for pets. He offered the Humane Society of the United States, which was running Lamar-Dixon at the time, some of the prison’s real estate. HSUS happily accepted. In the middle of the night, trucks began arriving, carrying hundreds of dogs and cats, plus a few geese, ducks, and horses. The prison housed them in a former dairy barn just a mile from its main grounds. 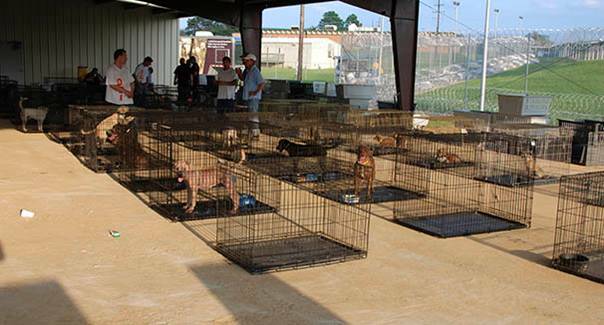 Volunteers from Lamar-Dixon set up kennels and a makeshift clinic, and the prison sent over twelve convicts to help feed, walk, and clean cages. Injured, starving pets were nursed back to health, and most were eventually reunited with their owners. The arrangement worked out so well, HSUS decided to make it permanent. In 2007, it gave the prison a $600,000 grant to build a real shelter. 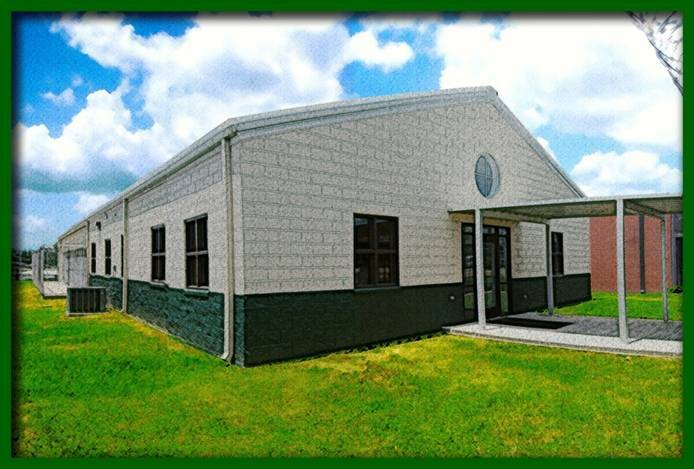 It would be used in future disasters like Katrina, but also as an adoption center for the local community. I’d come to check it out. When I arrive at the prison, I pull up to the guard gate. My rental car’s window is caked with bugs and it’s A/C struggling to overcome the oppressive heat and humidity. Colonel John Smith meets me on the other side. A 23-year veteran of corrections who has worked with police dogs for most of that time, he’s tan and solidly built with a gray moustache and short, brown hair. He wears a blue uniform and cradles a large black walkie-talkie. “Did you have any trouble finding us?” he says in a mellow Southern accent. Smith guides me inside the prison grounds, past a double gate that resembles a chain-link airlock. I’ve been among inmates before, but I’m still a bit uneasy. Suddenly, a tiny black and white rat terrier comes running up to us, yipping. “Come here you little tramp!” says Smith, hoisting the mutt into his arms. It’s his dog, Chirro, who comes to work with him every day. I begin to feel a bit more relaxed. We enter the main shelter. Opened in 2010 on the fifth anniversary of Katrina and built on the site of a former chapel, it’s a white-brick building with a peaked roof that looks a bit like a squat bungalow. Inside, we’re greeted by Smith’s junior officer, Master Sergeant Wayne Aucoin. Thin and young, with a shaved head and a brown moustache slightly less bushy than Smith’s, he manages the day-to-day operations of the facility, and he’s eager to give me a tour. Despite the modest exterior, there’s a lot going on inside Pen Pals, as it’s known. Aucoin shows me the surgical suite, with its metal exam table and anesthesia machine. There’s also a grooming area with a large sink, a computer room for tracking the animals that come in and out, and an education alcove. Here, inmates can peruse a growing library of veterinary textbooks; learn, from posters on the wall, how to spot zoonotic diseases like roundworm; and try their hand at diagnosing parasitic infections with a microscope in the corner. A few prisoners buzz about as we tour. Wearing jeans and light blue T-shirts with “DCI” in large orange letters running down the side, they wash bowls and mop floors. And, of course, there are the cats and dogs. Two rooms lined with metal cages have the capacity to house about 30 felines. Today, there are a couple of longhaired orange kittens, a black cat missing an eye, and a handful of others. Many are brought in by the prisoners themselves, from tool sheds and exercise yards. “The fences don’t really keep them out,” Smith says. “They slip through them like wind.” The dogs live in a long, narrow space flanked by kennels. There’s room for about sixty of them, but right now there are just a few mutts and pit bulls. Still, the barking is almost deafening as we pass. After we tour the main facility, Smith and Aucoin lead me out the back door onto a wide, grassy yard flanked by barbed-wire fences. In the distance is a 10,000-square-foot pavilion with an open concrete floor and a steel roof. As we head over, Smith tells me that the inmates take the dogs onto this field to walk them and teach them basic obedience. “Watch out for land mines!” he smiles. The pavilion is filled with dozens of makeshift kennels. There are a few mutts here now—the structure serves as a quarantine area before they’re brought into the main building. But its main purpose is as an emergency shelter. When a storm like Katrina hits, inmates can quickly build hundreds of crates, housing up to 250 dogs and 100 cats. If needed, they can split the crates in half, doubling those numbers. There are also generators to run fans, in case the prison loses power. 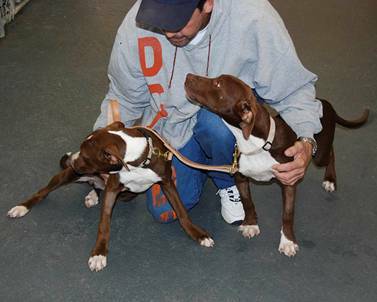 During Hurricane Gustav in 2008, the pavilion housed 40 dogs and 30 cats. And last week, when Hurricane Isaac struck, Lamar-Dixon sent a few pets over. The warden didn’t even have to contact them. “We got a call from someone saying, ‘Hey, can you take a couple of dogs?’,” says Aucoin. For more information on Pen Pals, including how to donate to the shelter, check out its Facebook page: PenPalsIncAnimalShelter.